“There’s a touch of tomorrow in all that Cole does today.” – JJ Cole. That is the advertising slogan that the Cole Motor Car Company used and it was aptly fitting for the company that made high end, quality built cars that were typically ahead of the industry. This site is for Cole Motor Company car owners, enthusiasts, and those that are interested in the fascinating story and history of one of Americas great automotive stories. 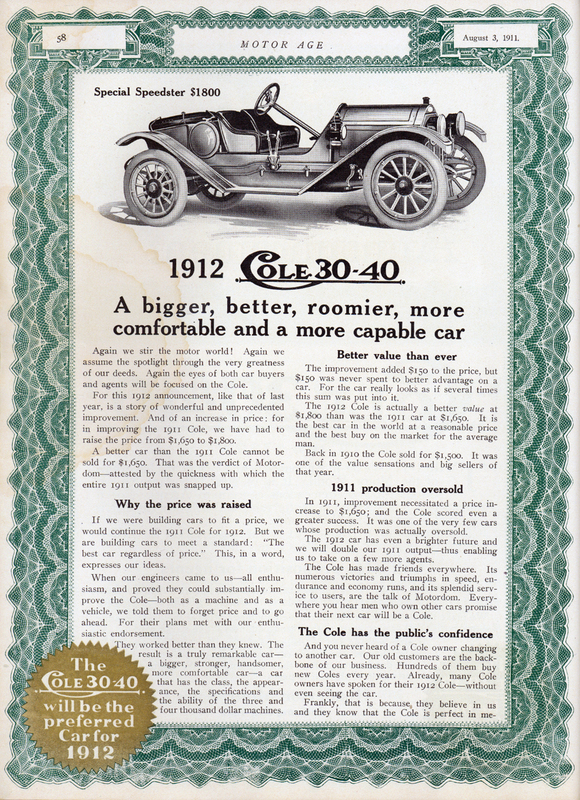 Are you interested in information about the Cole Motor Car Company? Are you wondering how many Cole Motor cars still survive (77 known to survive today)? Are you interested in connecting with other owners of Cole Motor cars? Are you interested in learning more about a true American automotive success story? If so, you have come to the right place. Event Announced: Cole 2019 Meetup – Be sure to check it out!